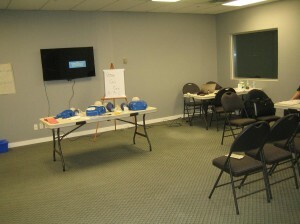 We partnered with Edmonton First Aid to deliver outstanding standard first aid training courses in Edmonton. The company is popular for its affordable training prices and great client care. It is one of the leading training providers in the area. Classes are provided all throughout the week in different classroom locations. Classes include private courses for groups of any size and re-certification training for participants that meet required prerequisites in order to renew expiring awards. At Edmonton First Aid, customers can rest assured that they will be taught by the best CPR and first aid training instructors. To register for a standard first aid course in Edmonton, Alberta use the course registration form available below. Established in 2008, Edmonton First Aid Ltd has grown through the years. The company now has 4 training centers in the Edmonton region. Candidates can register for workplace approved standard first aid course or take private and re-certification courses in standard first aid. Customers have the option of selecting CPR level “A”, “C” or “HCP”. For more information, you may visit the website of Edmonton First Aid Ltd.
Edmonton First Aid offers candidates the option of choosing CPR and AED levels which are “A”, “C” or “HCP” (CPR level “C” is for health care providers) to opt with the standard first aid course. All CPR/AED classes follow the newest and highest standards when it comes to cardiopulmonary resuscitation education. Classes may vary in duration depending on the standards of CPR/AED training added with the class. All course prices include taxes and manuals. Who Needs Standard First Aid Certification in Edmonton? This is only a brief list of some of the individuals that are required to be certified in this two-day course. Edmonton First Aid participants are assured that there are no hidden fees. The prices are all listed online with no additional fees presented afterwards. Training centers are comfortably situated throughout the region. Aside from neat classrooms, the training locations are all conducive for learning. Interested participants may register via different methods. You can easily enroll via online registration which is fast and simple. You may also choose to register via the phone or through e-mail. Someone will always be available to assist you once you decide to call Edmonton First Aid’s office. Edmonton First Aid also provides participants with renewal and private classes. Private classes are readily available for individuals, classes or companies at various rates. You may contact Edmonton First Aid at [email protected] for additional information. Standard first aid renewal courses are available at least once a week in all of the training centers. All re-certification courses include CPR and automated external defibrillator (AED) certification. This service provider is known for good quality classes and up-to-date equipments. With Edmonton First Aid, you are assured of affordable prices, excellent instructors and the latest first-aid, cardiopulmonary resuscitation and automated external defibrillator (AED) practices and standards.